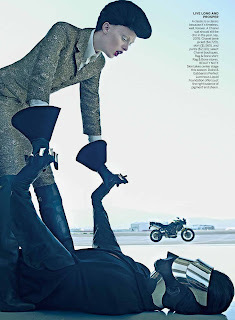 American Vogue's September issue is its biggest ever weighing in at a massive encyclopaedic 916 pages. I can already feel my fingers aching at the prospect of flicking through the hundreds of pages of advertorial but rest assured there are plenty of editorial gems to be uncovered. 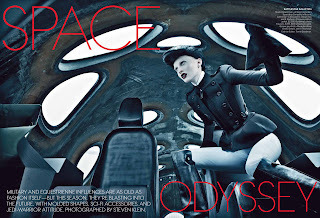 Supermodel Karen Elson takes readers on a "Space Odyssey" courtesy of photographer Steven Klein, decked out in military and equestrian influenced Fall fashions. 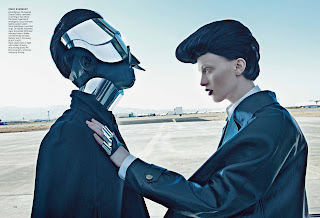 Elson is transformed into a space goddess under the artistic vision of make-up and hair stylist Val Garland and Garren. 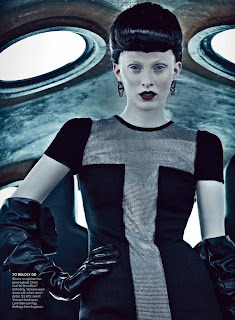 Stylist Tonne Goodman's meticulous eye and brazen imagination imbues this editorial with a eerie Gattaca-like feel. And as always, Elson ever the chameleon, rises to the occasion immersing herself in the role of Jedi warrior leading her battalion of followers into unchartered territory.